potentially nervous: nuage, you two behave yourselves today....fats and i are going to get a second opinion! nuage, you two behave yourselves today....fats and i are going to get a second opinion! Good luck with the second opinion. I hope Fats is feeling at least a little better. I'll be posting an update soon, I'm waiting to hear about some results. Good luck with Fats. And Nuage, no prank phone calls. Bunny party with Bells and Nuage today! Cadbury will be bringing oat-kale nachos and blueberry dip! Good luck to Fats, and I hope the doc has some new ideas. Fresh perspective is a good thing. Thanks for the update. I was thinking the worst when you hadn't posted anything in a while. Me and Judy bunny are sending warm fuzzy vibes your way. Thinking of you. Safe travels. Good luck, hope you come back with good news. 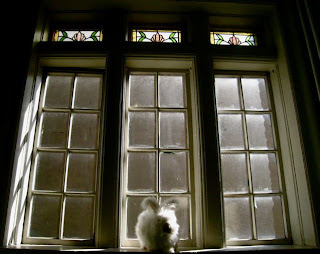 Bunnies do love to sit in windows don't they? Mine love to sit on this stool i have near these big windows, but if i take them outside they freak out, but that could be because most of them were rescued by the humane society from people who abandoned them outside. Good luck with the second opinion! Beautiful shot Alice! Nice pose Nuage!